[NADI] 09 April 2018 Gender equality advocates are usually trying to influence Police policies, practices and processes from the outside – this time however the tables are turning with gender advocates being developed and trained from within the Police. 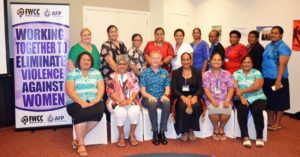 The Gender Advocacy Training (GAT) for Regional Executive Police is a groundbreaking initiative being rolled out by the Fiji Women’s Crisis Centre (FWCC) in partnership with the Australian Federal Police. Lead trainer and Coordinator of the FWCC, Shamima Ali told the participants during the opening of the 2-stage GAT course that the overall outcome of the training is for police to respond appropriately as gender advocates to violence against women cases, “once we know all police are able to respond efficiently, effectively and appropriately to cases of violence against women and are also able to promote gender equality within the police force, then there will no longer be a need for advocates like the FWCC because we will have worked ourselves out of business,” said Ali. Ali also thanked AFP for recognising Pacific expertise in the area of Gender Based Violence (GBV) and confidently partnering with the FWCC to carry out this initiative. The GAT 2-stage course for senior level executive police women commences today Monday 09 April through to Friday 09 April at the Radission Blue Nadi Fiji. The same course will be run for senior level executive police men next week 16-20 April 2018.